I have been building and designing for some small amount of time and I find myself quite fond of single boom pushers. I'm not sure why i like them protection for the prop and simple nose to repair on impact probably weigh in. this fact and a bit to windy day led to this particular parambulator being up for repairs or a complete rebuild. 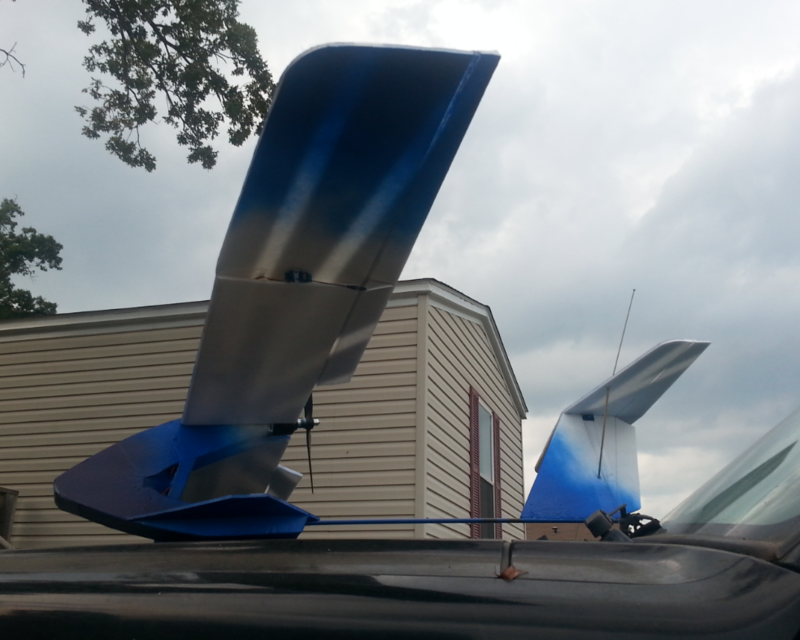 I am looking for options for a new tail boom. I love my t tail... is it a bad choice for this configuration? Is the tail too long? Is it too short? Nice work on your design. It would be pretty easy to just build a foam boom. This shouldn't really effect your overall weight if you eliminate the weight of the carbon. Otherwise a square piece of carbon would resist rotation a bit better. You could also try using stronger adhesives on your carbon boom. Keep the tail vertical and use foam safe epoxy of wood glue (something very strong that won't melt the foam) and make to "welds" along the piece of the boom that connects with the fuselage. the weak (and possibly flex) point could be the elbow on the fuselage, if design could be improved i'd suggest adding some vertical structure in that gap between belly and wing mount. the distance from tail to wing should be fine, and the twist can't be helped much with such design. theoretically, on a same material and cross section, the longer the boom the more twist will be apparent. it could be optimized with sturdier built, etc. of course, like square boom as pointed out above. 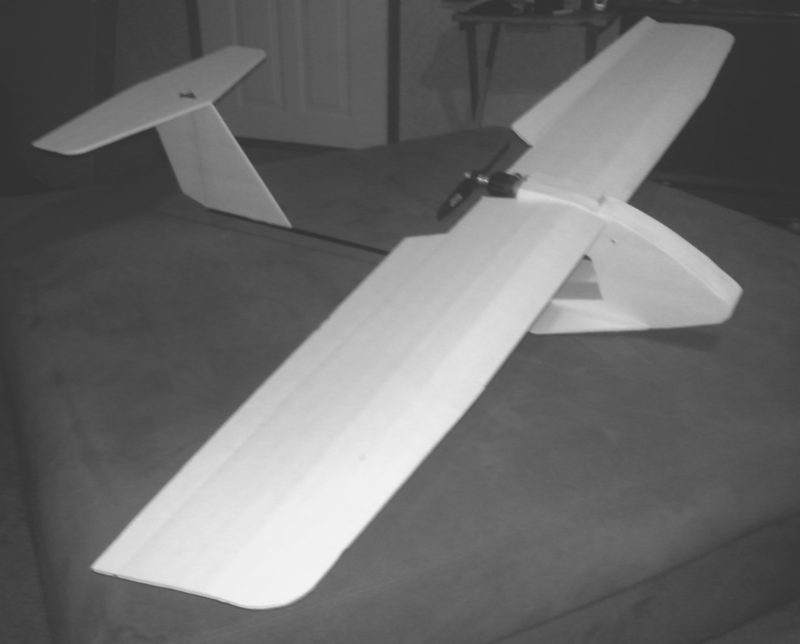 another point would be to reinforce your boom mounting to the fuselage, looks pretty thin from the pic, though looks great. I'ma bit of a blinking bulb when it comes to bright ideas. my current solution is a nearly solid fusalage up front, only room for electronics. I'm planning out a foam boom. Hollow as seams best. Also it looked like the boom rotated in the fusalage. That isn't actually what's happening. I was trying to describe the twisting. How about wooden dowels or square stock? I'm thinking pine. Balsa is hard to find for me. what are the anycopters booms? the arrowshafts aren't really easy to find in different sizes. The cheap ones , like I'm using, are biggest. the more expensive ones get smaller. Some more expensive ones are woven carbon as opposed to the non woven ones I have. I am hoping to find something better where could I source square carbon tubes. Preferably big enough that I can run servo extension through instead of 're wiring servo. Current servo busted gear. I think this happened in transport. Do y'all think these small servos are a bit to small for this size of plane? Would long pushers be better? What would shortening the boom do to the plane. the tail is currently to long for a single she at of foam to stretch the fusalage. A foam boom? How would y'all do this? i think it's basswood, i could be wrong. personally i think it's rather pointless to make one part of the plane bulletproof while the rest aren't. unless it disturbed the flight so much, then i'll leave the twisting boom be. perhaps just strengthen it more with hot glue etc. 9g servo should suffice imho. i suppose it depends on the design and plane parameters, but generally pushers are placed near plane axis. much easier to understand watching than explaining in words. Was would long pushrods be a better choice than servos mounted so far aft? try a triangular foam boom as they are lighter than a square one. if the foam board isn't long enough then join them with a smaller triangle inside so both pieces get a good glue point like in the nose of the mini Guini. it depends on the size of the push rods but usually pushers are tail heavy so mounting the servo farther forward will help cut down on tail weight.